My first full year in my own house has gone by quickly, and here I am sitting down again to write my annual Christmas letter. It was easy to choose a Christmas Bible passage to lead off with: my church's annual children's Chirstmas service was this morning, and I participated as part of the adult choir. One of the pieces we sang was a beautiful two-part setting of John 1:14, speaking of Jesus Christ as God's word made flesh and given to live for a time among us. My sister Mary came to visit in February, taking a break from Milwaukee's cold weather to enjoy Palo Alto and my guest room for a week. We had a fine time doing a few touristy things and relaxing a lot. I've done a few things to fix up my place this year, but it's gone slowly. 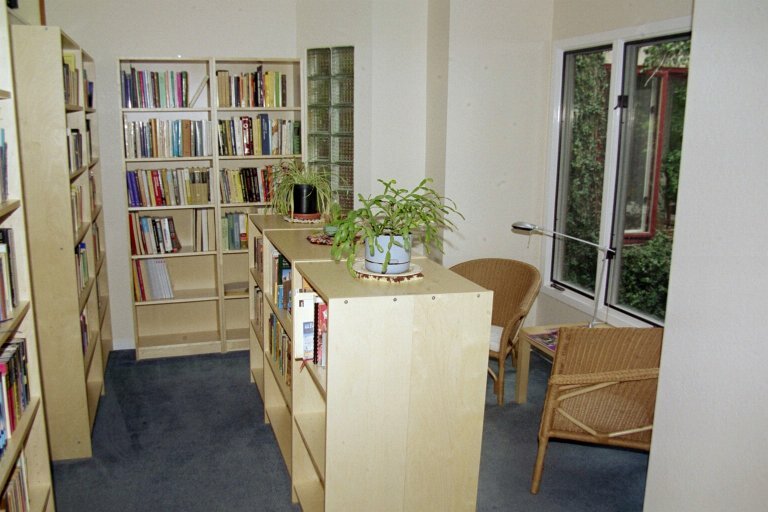 I had the entire interior painted, I replaced the old curtains with 2-inch wood slat horizontal blinds, and I put up bookshelves in an area that was meant to be the dining nook, turning it into a library (see picture). You can see more of the results in the picture page on my web site, http://tim-mann.org/. I didn't have the blinds up when I took those pictures. I was able to spend a week at Bible camp as music leader again this year after having to miss last year. Camp went well, though attendance was a bit low. Ever since I moved to California I've been a frustrated cat lover, living in apartments that didn't allow pets. In September after the new paint was dry, I headed out to a local shelter and adopted two cats, Kevin and Tessa. My plan was to choose two young adult cats that seemed friendly, healthy, and active, and that had been living in the same enclosure at the shelter so that they were already somewhat used to each other. It worked out really well. Kevin (3 years old, black with small white markings underneath) is a big, mellow, affectionate guy. Tessa (2 years old, tortoiseshell) is smaller, just a bit pudgy, but very active and playful – enough to get Kevin to come out of his shell and chase her around the house. They're quite a pair, sometimes snoozing together or grooming each other quite companionably, other times chasing each other around and wrestling. At the same time they're very much people cats – they come to greet me when I come home, follow me around the house, and love to be petted and played with. I'll be spending a quiet Christmas at home again this year. I'm taking off the week between Christmas and New Year's, but I plan to spend it at home working on projects, perhaps doing some day trips around the area, and relaxing. I hope to travel a bit to visit family (and have them visit me!) in 2006, but don't have any firm plans yet. Anyone who may be visiting the San Francisco Bay Area – my guest room is available, so give me a call.